Lunch time.....tired of the same old same old at the town center...as we came out from Kuan Wellness Ecopark, we saw this restaurant. Looks pretty full. Food must be good gua. While waiting for the food, I went exploring. It's just by the seaside. Wanted to climb down but Mamarazzi said too dangerous. 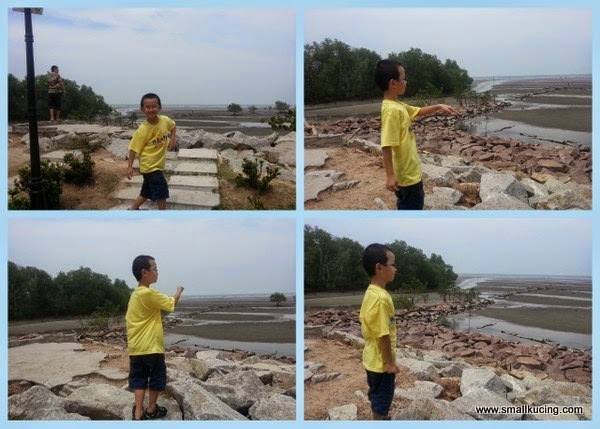 While I was exploring the seaside, Kaw Kaw was exploring the other side of the restaurant pulak. 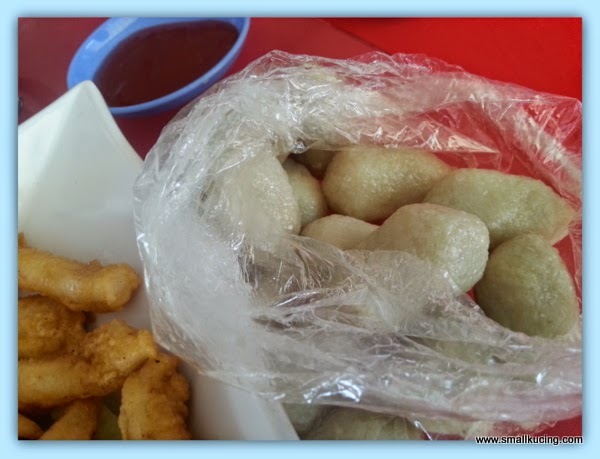 Finally found the fishball that she have been hunting. 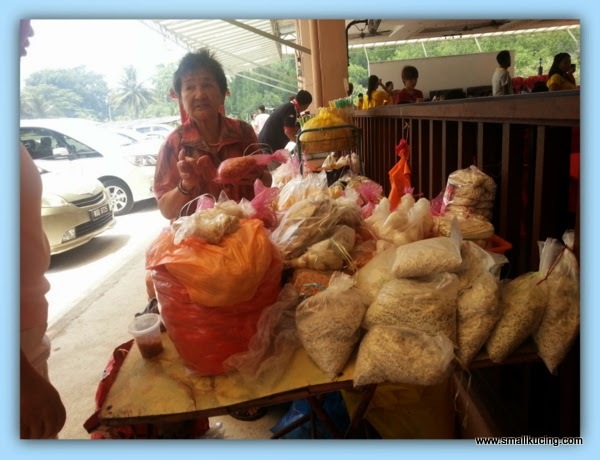 This old lady selling all sorts of sea products...fishball, taufu pok, fish paste, fu chuk, dried shrimp and etc. Despite the large crowd, the service was fast. We didn't have to wait long for the food to be served. 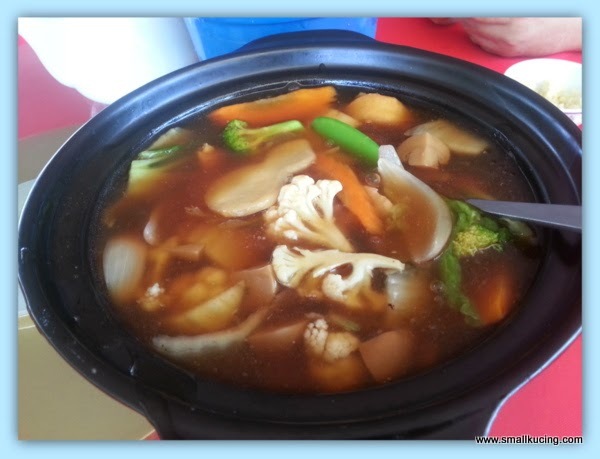 Claypot Taufu . I love the gravy. Wonder how they make it...Taste good. Even the onion tasted sweet. 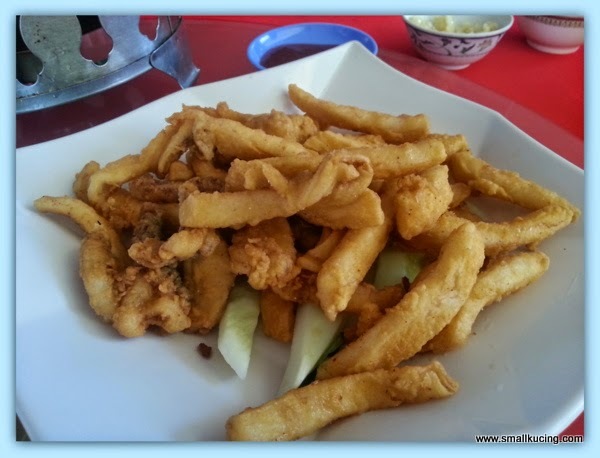 Fried Sotong....Mamarazzi didn't like it as it was chewy but Papa like it and said the texture memang like that punya for this. Dunno why but now I started to like eating Clam. 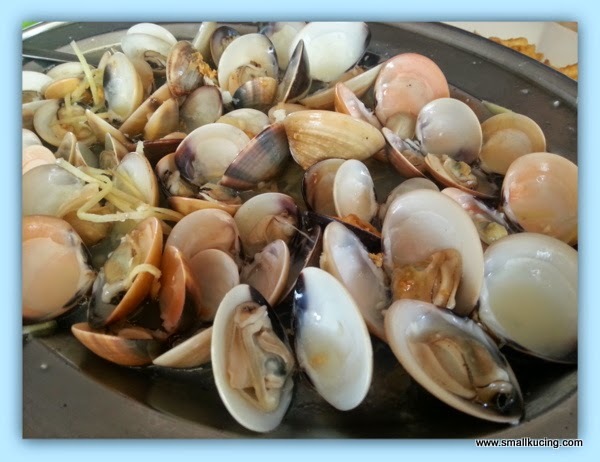 These are steamed Clam. Fresh. 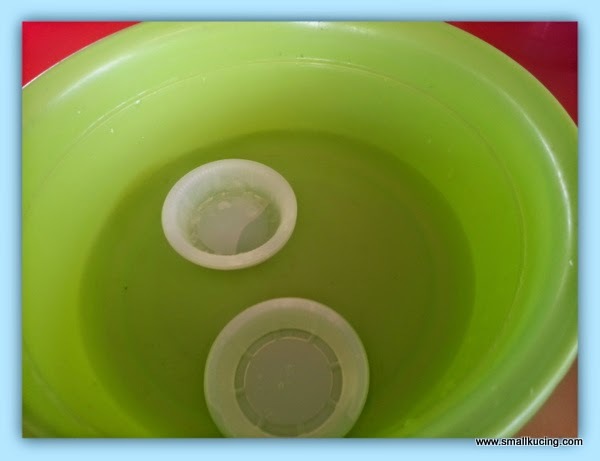 The only suggestion that Mamarazzi wish to make is that for them to do away with these little plastic sauce plate. 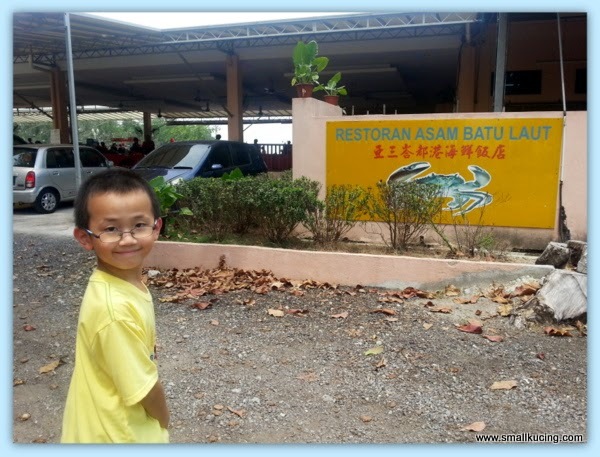 It is okay for fast food outlet but not so proper for restaurant . Yes, next time will come to this restaurant again to try out its other dishes. I never really been there despite seeing aunt claire posts on it . hope to go some day. Yes so far so good . Yaloh. They shouldnt use those disposable sauce plate. Price is cheap. I like that clams. Slurp. 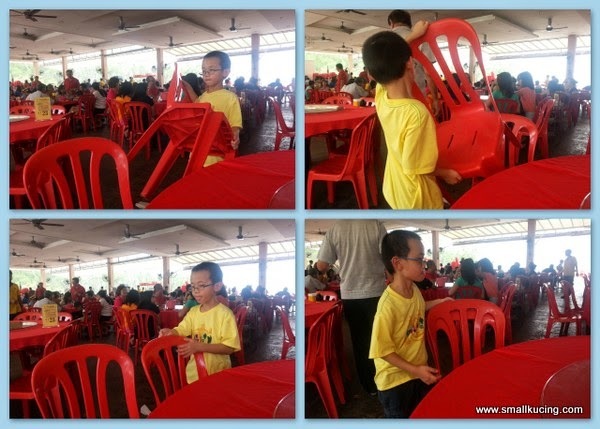 yes think that is the cause la coz that day the restaurant was very full. Hope they will revert to the normal plates la. Oh yeah if that place is full I will also assume the food is good.. hehe.. Aikks, so little food you all ordered this time.. That claypot tofu I know la, your favourite.. Must have that to eat with rice.. My favourite also..
A bit out of the way for me but usually such places serve food that is good and cheap. Ok, will come and try the next time! hahahaa..
Bookmark this place, bring me there!!! Yum I love clams too! Just had a load of them the other day at a seafood buffet. Burp!! yalah, of course would be nice to go and explore the place a bit and find new restaurant if you have got the time.. everyday those few restaurants also can be quite boring.. Think it'sn normal pricing la. Not kene slaughter. I love seafood. errr.... that's too little food for me. Huh sotong like french fries haha. Oh nice fresh clams. Used to 'dig' them with our bare hands in the muddy sea shore in Butterworth back in the 70's. Not easy to dig as the water is waist deep. 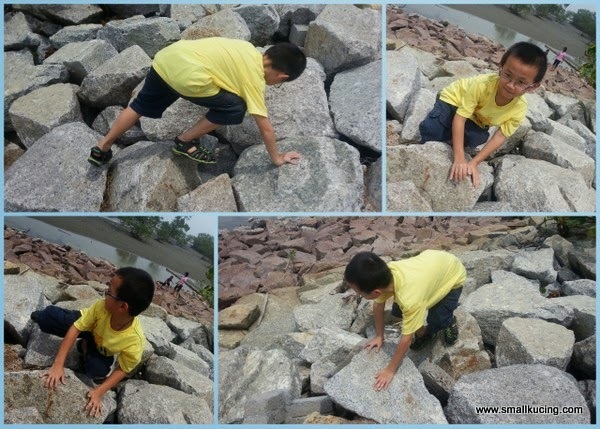 Those big rocks are useful, can do a bit exercise before eating, haha! I agree, price is reasonable! I like to eat chewy sotong. Small kucing should like to ear clams cos cats like to eat seafood mar. 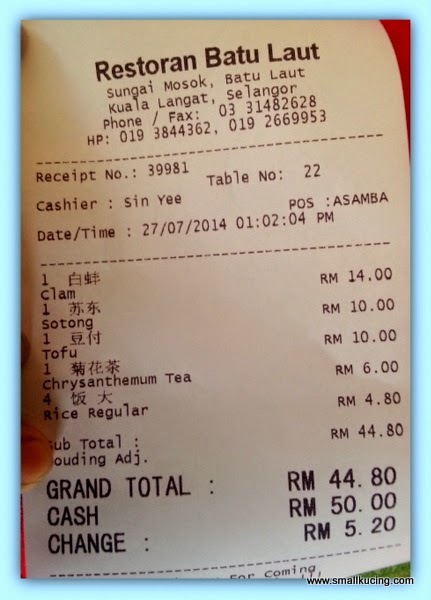 The price was cheap la to feed 4 persons! I like clams too, but only if they get all the sand out of them.